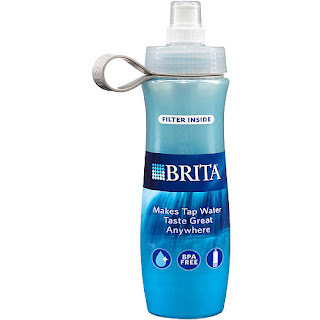 How is a Brita water bottle like God? I like filtered water. Let me rephrase that - I like very cold clean water to drink. The cheapest thing I have going is those Brita sports bottles. They rock! I keep three in the fridge and maybe take one out to keep near me. When it isn't cold anymore i simply put it back in the fridge. I drink so much water that i need to have three to guarantee at least one is really cold at any one time. You know, cuz it takes a while to cool them off. I got home last night, and i couldn't find my blue water bottle. I was so upset. This was a legitimate crisis (in my mind lol....). I considered buying a new one, but realized that I had simply misplaced the blue one. So, I somewhat blocked it out of my mind and calmed down. I got still. I quieted my mind. Then a thought occur ed to me. I had hidden the blue water bottle in the fridge. I had tucked it back far in the fridge where the human eye couldn't see it. When my mind was still, it rushed to my remembrance where I had put it! While this may not be the best example of how God works, it is similar. When we are focusing on a problem and trying to come up with a carnal solution in our mind. We are too caught up in the situation. We can't find a solution with our physical eyes. We need to get in the spirit. Which this is hard to do if you are fretting about it. Often times God will bring to our remembrance the solution. That same spirit often warns us of things to come as well! Don't you want a relationship like that?